While there have been many real-time search engine launches over the past few months (Scoopler, Topsy, Collecta, CrowdEye), most of them so far have fizzled (see Google Website Trends chart above). After an initial burst of curiosity, interest tends to dive. One exception, however, is OneRiot, which appears to be gaining some early traction in the real-time search race. OneRiot started to be noticed when it added link search from Twitter last May. But its search volume didn’t really take off until it launched its API, allowing other sites to tap into its real-time search and add it as a feature to their own Web app or site. OneRiot has 40 API partners, including Microsoft (sometimes bundled with IE)., browser add-ons Yoono and Shareaholic, and desktop apps like Nambu and EventBox. All of these API partnerships add up. 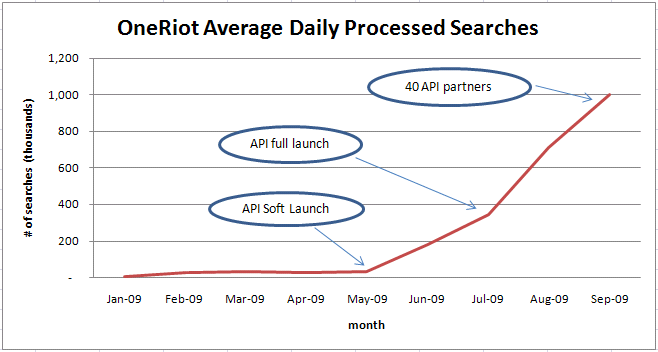 In fact, about 80 percent of OneRiot’s searches are coming through its APIs rather than directly on its site. OneRiot is building up market share by offering real-time search to others. (Rival Collecta is preparing to do the same thing by offering its own APIs soon). Search is a volume game, where the more search queries you can process, the better your results become. So OneRiot wants to power as many real-time searches as possible. To the extent that OneRiot can familiarize people with the concept of real-time search in as many places as possible, that’s a good thing. But ultimately it needs to drive people back to OneRiot.com where it can control the entire experience (and the cash).